NOTE: I'm doing a Whole30 right now, but if you're not- 1 T. of Dijon Mustard would be a really nice addition to this vinaigrette. Using the grater attachment of a food processor, shred the brussels sprouts. Transfer to a large bowl. In a small bowl, whisk together the lemon juice, mint, Bavarian Seasoning, and sea salt. Slowly whisk in the 1/2 cup oil. Add additional seasoning, if needed. 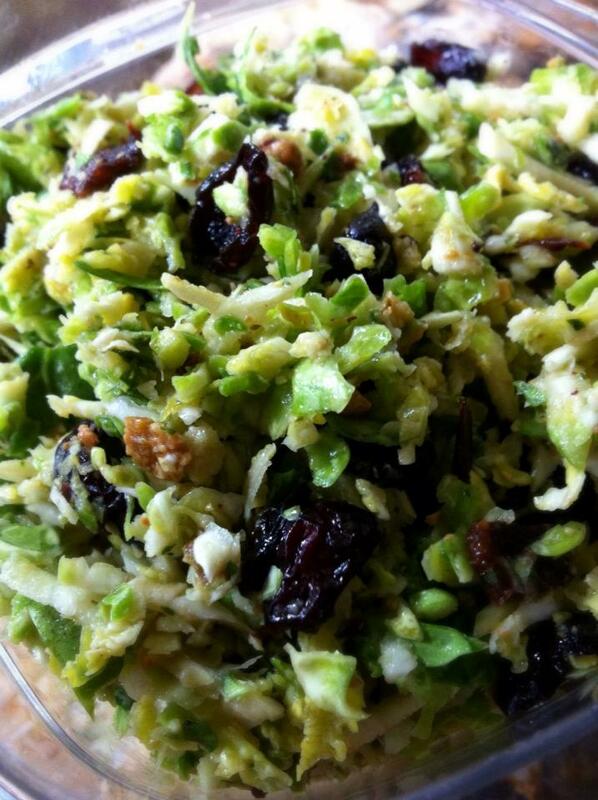 Add half of the dressing to the brussels sprouts and toss well to combine, adding more dressing as needed. Top with chopped pistachios, dried cranberries, and bacon pieces and serve. Wait, dijon mustard is a no for the Whole30? Shoot. I've been eating it. Couldn't find anything on the ingredient list that was a no :( PS. Totally making this salad soon. Looks amazing. Also checkout paleo recipes & cookbooks website. A Paleo Diet Recipes regime is 1 in line with the idea that the best diet regime is that individuals evolutionary family history in the paleolithic time. Since many weight loss plans healthy that heuristic, a lot of options are actually designed in addition to popularised within names such as caveman diet regime, paleolithic diet regime, primal diet regime. I am using this http://www.youtube.com/watch?v=D7dGAbUhFMQ product now and not sure that I can still eat this food or not? I am so looking forward to making this! I found the link to your blog on Nom Nom Paleo. Great recipes! Did you know you can shorten your long urls with Shortest and make money from every click on your shortened urls.